1. Preheat your oven to 175c/340F. Grease a large cake pan and line with parchment paper. 2. Make the syrup: add the sugar and milk to the melted butter, stir until completely incorporated. Pour the syrup into the greased and lined pan. 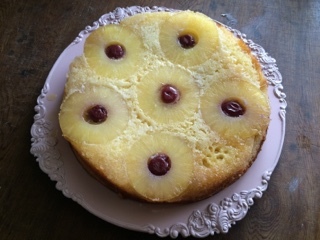 Top with pineapples. 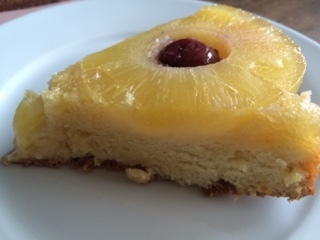 Place cherry in each center of pineapple. Set aside. 3. In a large mixing bowl, beat eggs, sugar and vanilla until creamy for about 5 minutes. 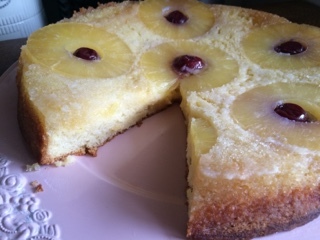 Add pineapple juice and flour. Pour batter over pineapples and cherries. 4. Bake in preheated oven for about 40 minutes or until toothpick inserted in center comes out clean. 5. Allow to cool completely for 1 hour. Immediately run knife around side of pan to loosen cake. Place heatproof serving plate upside down onto pan; turn plate and pan over. Leave pan over cake remove pan. Cool 30 minutes. Serve warm or cool. Store covered in refrigerator.